Don't miss out on this once in a lifetime excursion! An elephant's trunk contains about 100,000 different muscles! Weighing between 4,000 and 10,000 pounds the Asian elephant represents one of the most remarkable and intelligent creatures on the planet. Important in Asian folklore as they are believed to be cousins of the clouds and hold the ability to cause lightning, these complex land animals provide a captivating opportunity for human interaction. This is an experience you won't want to pass up. The Elephant Village you will be introduced to was opened in 1973 and serves as a sanctuary for former working elephants who were once used as the backbone of heavy lifting in the jungles of Thailand. No longer able to be used in that capacity they come to this particular camp for care as their habitats continue to diminish throughout the country. This safe haven is a non profit private company with all proceeds going to the guardianship of all elephants on the property. Your amazing trek through the jungle is a once in a lifetime adventure that will bring you up close and personal with these mesmerizing mammals. From the ox cart ride to the Thai lunch this full immersion amongst one of Asia's most treasured animals will permeate your mind for the entirety of your vacation. - Price includes private transportation, lunch, and admission to elephant trek. 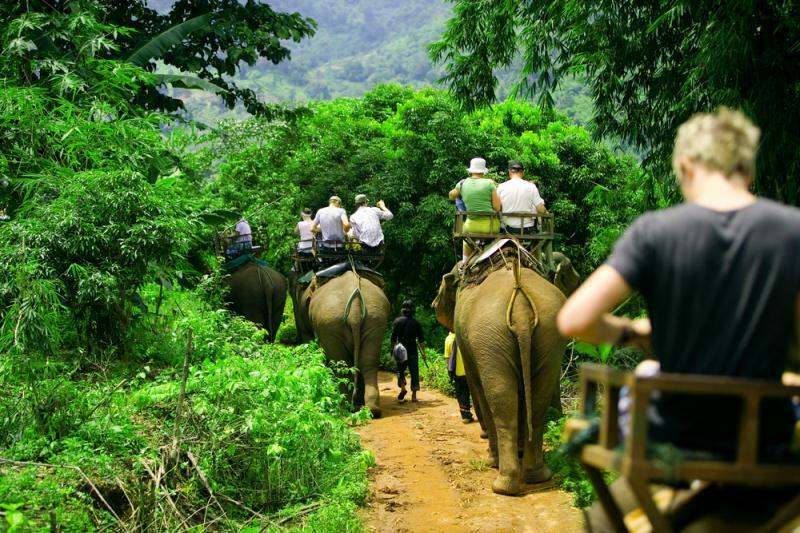 - Transfers are private but the elephant trek portion is shared. Please book price based on how many travelers you will need transfers for. - This excursion is recommended for travelers not interested in traveling to Bangkok on either their first or second day in port. Bangkok is about 2 to 2.5 hours north of Laem Chabang and this excursion takes place about an hour south of Laem Chabang. Due to travel time it isn't practical to pair this with other options. If you have any questions please contact ShoreTrips directly. - This excursion isn't recommended if you are pregnant or have a history of health issues. Although the elephant seating process is done via a ramp and has been designed for easy on and off ShoreTrips is not responsible for travelers deciding not to participate on the day of the tour. - Please alert ShoreTrips in advance of any dietary restrictions or food allergies. We will do our best to accommodate.